I’ve seen some doozies when it comes to gun safety violations. Looking at this list, it’s a miracle that I’ve not seen more events that lead to episodes of Untold Stories of the ER. I do much of my shooting at an outdoor range, smack in the middle of a National Forest. The Park Service has built it into a nice facility, complete with covered shooting benches and berms at 25 and 100 yards. What’s both wonderful and problematic about this range is that it’s unsupervised and open to the public at all daylight hours. As a Second Amendment purist, this is the way it should be. If we really believe in the unrestricted rights of all individuals, then we also need to believe in personal responsibility and accountability. What do I mean by that? If you’re going to own a gun, it’s up to you, and no one else, to take the initiative to learn how to use it safely. It’s up to you to learn how to behave safely when in the presence of others, like at a shooting range. If you don’t, and something bad happens, you, and you alone, are entirely responsible for the consequences. I used to be a nice guy when I saw people doing stupid and unsafe stuff at a public range. Not anymore. After all it’s my life at stake, and that of everyone else present. 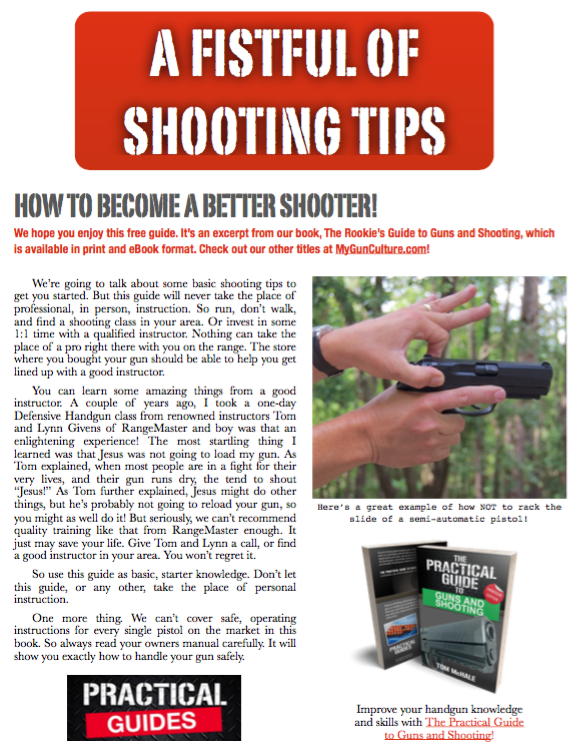 Of course, if I see a new shooter trying to learn the ropes, I love to jump in and offer some help. They’re almost always appreciative, and more importantly, a much safer shooter next time they come back. Now when I see someone who’s obviously been around guns for a while exhibiting unsafe behavior, watch out. If you think Richard Simmons was upset when they made him wear Sansabelt business slacks, you haven’t seen one of my range hissy fits. Screaming, stomping feet, tears – nothing is off the table. 5. Eyes and Ears Are Easily Replaceable, Right? It drives me batty when people show up to the range without eye or ear protection. Come on people, investing five seconds in the most basic shooting knowledge will tell you how important it is to protect your eyes and ears around guns. One day, a teenager was shooting a Mosin Nagant at the bench and I eventually noticed he wasn’t wearing ear plugs of any kind. He asked me if he could check out one of my guns, and I responded “as soon as you get some hearing protection.” With a slightly condescending look, he informed me that he was “conditioning himself for hunting season to get used to the muzzle blast.” Sheesh. I used to condition myself against migraine headaches by beating my forehead with a ball peen hammer. That didn’t help either. On a different occasion, I was shooting and heard a loud BOOM to my right. Looking over, I saw a shooter sitting at the bench staring at his now beet red and somewhat char-grilled hands. Turns out he had stuffed a 300 Blackout round into a 5.56mm AR rifle and gotten the predictable result. Considering that the upper and lower receivers, grip, barrel extension, magazine, buffer tube and barrel were all trashed, he was damn lucky to still have his fingers. Even more miraculous, I noticed he was not wearing eye protection. I immediately started inspecting his face, expecting to find puncture wounds. He claimed his eyes were fine. Who says miracles never happen anymore?